Now that I’m a new mom, I have so much less time to get ready! I’ve significantly adjusted my morning routine in these first few weeks since having a newborn, so I needed a quick and easy hairstyle I could do to get out the door. An all black outfit and sleek bun have become my go to easy look! What’s my beauty secret to get ready in a flash? To keep my hair in place through the Chicago winter [you can tell how windy it is even in these pictures!] 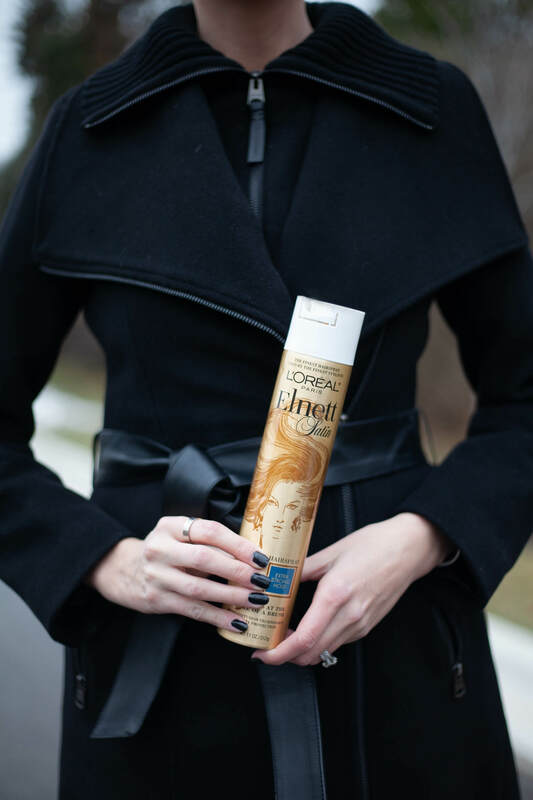 My go to is L’Oreal’s Elnett Hair Spray! This was always the hair spray that stylists would use on my hair in shoots. It keeps my hair in place without feeling heavy or crunchy, and it doesn’t feel like there’s a ton of product in it. Are you a new mom too? Share your beauty secret for a quick morning routine in the comments! I could use all the time saving tips you can share. I’m so glad you posted this! I’m actually about to be a new mom at the end of March 🙂 This look is so effortlessly chic, I love it!